There are 41 mutual funds with “tactical” in their names that are tracked by investment-research firm Morningstar Inc., including 18 that were launched since the beginning of 2012. Total assets in this fund category have risen to $4.92 billion from $1.10 billion in December 2007, according to Morningstar. …with the idea of exploiting the stock market’s strong points and dodging its weaker corners over time. Douglas Ramsey, one of the managers of the Leuthold Core Investment Fund, says the fund’s goal is to match the performance of the stock market over the full cycle with substantially less risk, which it has done. 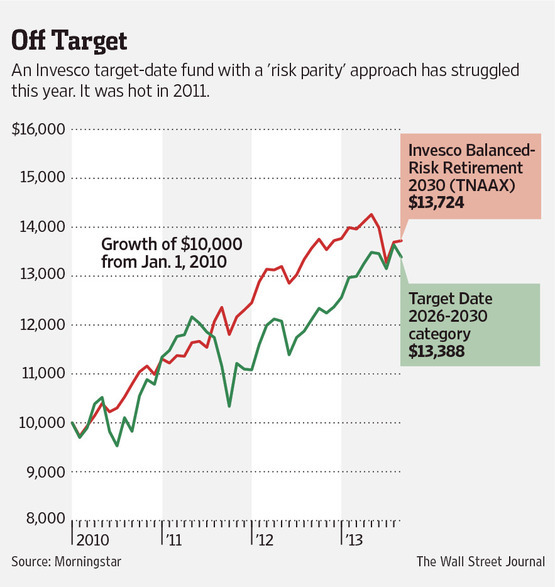 The fund can shift its stock exposure from 30% to 70%, and now holds 60%, Mr. Ramsey says. While it was originally conceived as a core portfolio holding, it’s now often used by registered investment advisers as a part of their alternatives allocation, Mr. Ramsey says. An equivalent fixed-income position of the fund is represented by the iShares 1-3 Year Treasury Bond ETF (SHY). In 2008, this position was insufficient to cushion equity declines and, as a result, the fund returned about -27.4%. From mid-2009 to mid-2010, in an attempt to capitalize on the stock market’s rebound, the fund started to decrease this position. However, the decrease was too gradual and ultimately reversed in the second half of 2010. Consequently, in 2010 the fund returned only 3.5% compared to about 12% of its peers. This illustrates the difficulties tactical allocation managers have with market timing. The only category where active management prevailed was international small-cap. Over the five-year period, the investment-grade intermediate and, to a lesser extent, global income were the only two categories in which, on average, active management provided superior returns. While valid, the above results paint only a partial picture of funds’ performance: the returns but not the risk. In contrast, Alpholio™, through its RealAlpha™ measure, clearly demonstrates how much value each fund added or subtracted on a truly risk-adjusted basis, i.e. with respect to a dynamic reference portfolio of exchange-traded products (ETPs). Over the five-year period ended Aug. 31, which includes the collapse of Lehman Brothers Holdings Inc. in 2008, the S&P 500’s 42% free fall to the bear market’s bottom and its subsequent 130% rally, five of the 10 biggest large-cap-stock funds posted better annualized returns than the benchmark. The average investor return, which takes into account buying and selling behavior, for all but one of the funds was much lower because investors were busy selling, according to Morningstar Inc.
Only investors in the T. Rowe Price Growth Fund enjoyed the full market cycle’s outperformance. 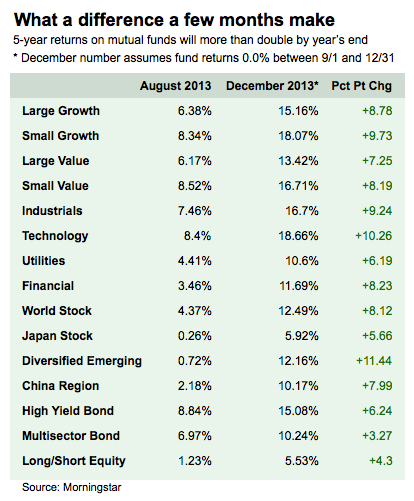 The average investor return over the past five years in the fund was 8.85%, beating the fund’s 8.63% return. After all, five years from now, it may be funds such as the American Funds Growth Fund of America (AGTHX) or the American Funds Investment Co. of America Fund (AIVSX) that are sporting the best 10-year annualized returns, even though both have underperformed these past five years. The chart clearly shows that on a cumulative RealAlpha™ basis, the fund started to underperform its reference portfolio in late 2007, i.e. well before the onset of the financial crisis. Therefore, the following five-year period was largely irrelevant to those investors who practiced “market timing” based on the above information. The firm’s American Funds have lost $242 billion to withdrawals since the end of 2007, while Vanguard Group Inc., the largest index-fund provider, has attracted $607 billion, according to Morningstar Inc.
Capital Group, based in Los Angeles, in a study released today, argued that its stock-picking mutual funds outperformed their benchmark indexes in the majority of almost 30,000 periods examined over the past 80 years. That included 57 percent of one-year stretches, 67 percent of 5-year periods and 83 percent of 20-year ranges. The Capital Group study examined 17 of the company’s mutual funds that invest in equities or both equities and bonds. It measured their performance over every one-, three-, five-, 10-, 20- and 30-year period, on a rolling monthly basis, from Dec. 31, 1933, through Dec. 31, 2012. Should investors care? Not really, because over such a long period of time, and especially in the last 15-20 years, the nature of investing has changed dramatically. There is more information available about both stocks and bonds, and this information is propagated with higher speed to a much broader investment audience, which makes markets more efficient and the job of an active manager more difficult. In addition, composite investment vehicles other than mutual funds — exchange-traded products (ETPs), tracking an ever-expanding spectrum of indices — have become readily available. Finally, comparing just the returns of a mutual fund against those of its benchmark is largely meaningless because it does not fully adjust for the fund’s risk. Alpholio™’s methodology seeks to overcome this limitation by providing a dynamic, custom reference portfolio of ETPs for each analyzed mutual fund. Only the excess return of the fund over that of its reference portfolio, i.e. the RealAlpha™, counts. Capital Group’s largest offering, the $123 billion Growth Fund of America, has seen its assets drop 31 percent in the five years ended Aug. 31. During that time the fund returned an annual average of 6.4 percent, compared with 7.3 percent for the S&P 500. Despite a recent improvement, the fund’s performance in the last five years has been unimpressive. Small wonder many investors voted by withdrawing their assets. The Fund invests primarily in equity securities issued by U.S. companies. Under normal market conditions, the Fund invests primarily in companies with market capitalizations of greater than $1 billion that the Adviser believes offer the best opportunities for growth. The Fund may invest up to 25% of its net assets in foreign securities. When buying and selling growth-oriented securities, the Adviser focuses on the company’s growth potential coupled with financial strength and stability. When selecting specific growth-oriented securities, the Adviser incorporates the firm’s top-down macro-economic views and focuses on individual security selections (referred to as a “bottom-up approach”) based on qualitative and quantitative research. In seeking to meet the Fund’s investment objective, the Fund’s investment Adviser utilizes a disciplined investment process designed to help enhance investment returns while managing risk. As part of these strategies, an in-depth proprietary analysis is employed on an issuing company and its securities. At the portfolio level, risk management tools are also used, such as diversification across companies, sectors and industries to achieve a risk-reward profile suitable for the Fund’s objectives. The Fund invests primarily in equity securities issued by U.S. companies. The Fund currently anticipates that substantially all of its portfolio will consist of securities of companies with large and mid-sized market capitalizations. The Fund’s investment adviser generally defines a large cap company to have a market capitalization in excess of $25 billion and a mid-sized company to have a market capitalization greater than $1 billion, up to $25 billion. The Fund may invest up to 25% of its net assets in foreign securities. In pursuing its investment objective, the Fund seeks out securities that, in the investment adviser’s opinion, offer the best opportunities for growth. The Fund’s investment adviser typically considers the company’s financial soundness, earnings and cash flow forecast and quality of management. The Fund’s investment adviser seeks to lower the risks of investing in stocks by using a “top-down approach” of diversification by company, industry, sector, country and currency and focusing on macro-level investment themes. In addition, these documents show the same nine managers for both funds. Therefore, it would be reasonable to assume that both funds will pursue very similar investment strategies, although the “select” in the ETF’s name would suggest a more concentrated portfolio than that of the Growth Fund. Unless the forthcoming active ETF adopts a drastically different investment strategy, the historical risk-adjusted performance of its sibling mutual fund does not bode well for the future of this new product. This will undoubtedly lead to a marketing promotion from fund companies and advisers touting the five-year “performance” of funds in absolute terms. Moreover, absent a major downturn, numbers will look even better in about six months from now, when the trailing five-year period starts at the market’s bottom in early 2009 (re: S&P 500®’s close at 676.53 on March 9 that year). Investors focusing solely on fund returns in isolation of relevant benchmarks make a classic mistake. Luckily, Alpholio™ can help: not only does it provide a custom benchmark for each analyzed fund, but it also makes this reference portfolio dynamic, truly adjusting for an ever-changing risk taken on by the fund over the analysis period. Therefore, from Alpholio™’s perspective, the passage of fifth anniversary of the onset of the financial crisis is irrelevant. Driving the fee increase is the cost of newly issued funds. Since 2010, the average net ER of a newly issued fund is 0.70%, according to Morningstar data. Not surprisingly, as the ETP space becomes more crowded and basic indexing is increasingly well covered, more niche products with a small amount of assets under management (AUM) and, consequently, higher ERs are introduced. However, a straight ER average is less indicative of what a typical investor would pay compared to an asset-weighted average. For all ETF types, the ER decreased or stayed the same between 2011 and 2012, with an overall decline by about 7.3%. Therefore, on an asset-weighted basis, ETF fees exhibited an opposite trend to that on a straight average basis. That is great news for both ETF investors and Alpholio™, as the fund expense component of the (negative) excess return became smaller.